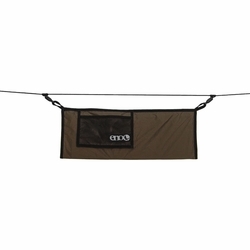 ENO Talon Ridgeline. The Talon is so efficient and so versatile you'd think it was made in Sweden. This featherweight, overhead organizer fits in your pocket and sets up in seconds. With the Talon, your ENO rain tarp is always perfectly centered; your Hi-Fi Speaker Case and Twilight Camp Lights are always within reach; your wet socks can dry in peace; and, of course, you are the envy of the campground. Eagles Nest Outfitters. Unfolded dimensions: (L x W) 17" x 8"